Sunstar solar pool heating panels are tough, there is no other way to put it. Sunstar panels are easy to install, they are designed to extend your swim season so you can enjoy your pool more and have the piece of mind that your new solar pool heating panels are going to be on your roof for a very long time. 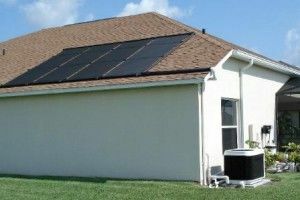 Sunstar solar pool heating panels are low maintenance and they look great on the roof. Using a unique connection clamp between each panel there is no need for the old style rubber hose and clamps between each solar panel. 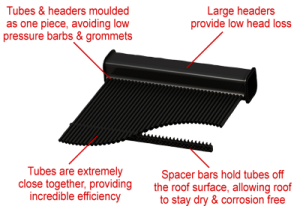 The Sunstar clamps will never leak or rust and they don’t require regular adjustment like other brands which means you could have a solar pool heating system that is maintenance free. Installing a Sunstar solar pool heating system could increase your swim season by as much as 5 months year. Speak with our Heating Consultants today about how much coverage is required to achieve optimal swim times and desired temperatures in your suburb.